As part of our fundraising for Great Strides, we’ll be running a garage sale on Saturday May 21 2011. We sent out invites to our neighbours today. Ideally, we’ll be able to make it a street wide garage sale, with some of our neighbours participating. Hope for sun on Sat May 21! We are the Dow family and we live at 4418 Dennis Ave. Our daughter Katie has Cystic Fibrosis. Cystic fibrosis (CF) is the most common, fatal genetic disease affecting Canadian children and young adults. There is no cure for cystic fibrosis. 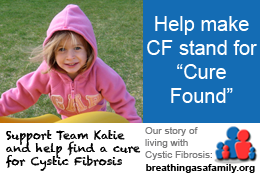 CF is a multi-organ disease, primarily affecting the lungs and digestive system. A build-up of thick mucus in the lungs causes severe breathing problems. It may be difficult to clear bacteria from the lungs, leading to cycles of infection and inflammation, which damage the delicate lung tissues. Thick mucus also blocks the ducts of the pancreas, preventing enzymes from reaching the intestines to digest food. People with CF must consume a large amount of artificial enzymes (average 20 pills a day) with every meal and snack, to help digest and absorb adequate nutrition from food. Katie has to endure 2 to 4 hours of treatment a day to try and loosen the mucous in her lungs as well as take enzymes just to be able to digest her food. The median survival age for someone with CF is 47.7. This just isn’t enough for us and Katie needs a cure. On Saturday May 21st we are having a garage sale to raise funds for Cystic Fibrosis. Our hope it to make this a street wide sale, as we know that many other streets in Beamsville have had major success with this. We will be donating our proceeds to charity, however, there is no pressure for anyone else to do this. In making this a street wide sale, we can advertise it that way and there will be a lot more traffic coming through the area. As well as advertising in the local paper, we are also hoping to have an article written about the event. If you would like to participate in this yard sale, please let us know by giving us a call at (905) 563-7195 or emailing us at juliedow@hotmail.com. p.s. If the weather is poor on Sat May 21, we will reserve Sunday May 22 as the rain date for this event.